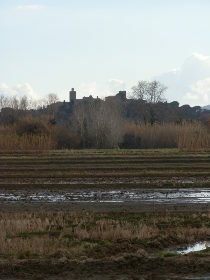 The area between Pals and Torroella de Montgri is a flat area full of fields for growing rice as it was once the site of an ancient lake or sea marsh fed by the waters of the river Ter. 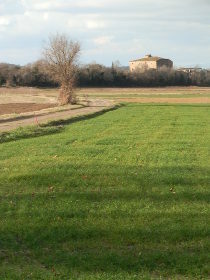 The neighbouring villages of Fontclara and Fontanilles fringe these paddy-fields until they turn into fruit-growing areas close to Fontanilles. As you pass through this area over the course of a year, you'll see the paddy fields flooded, planted, rice growing and then being harvested. Flatness generally for me, doesn't make a good walk as it lacks variation, but this is an area we hadn't explored and there is an old rice mill (Moli d'Arros in the middle of the paddy fields). What was more of a surprise was the number of birds we saw. Being January with water still in the fields, they are like a wetlands for birds and we were lucky enough to see a stork, lots of herons, plovers and a number of birds of prey. 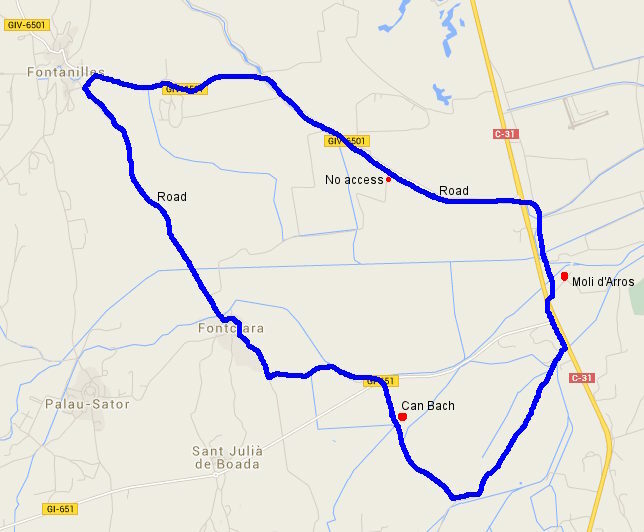 The downside that we discovered was that the route from the mill to Fontanilles was exclusively on the road. We may have missed a turn, but other tracks into the fruit espaliers were marked as private. We start in Fontclara, a small but well-to-do hamlet close to Palau-sator and from here we take the path across the fields in the direction of Pals - actually part of the GR92. The path is raised from the level of the fields and each field is bounded by a low mud bankl. When the time comes, farmers flood the fields using the many pumps that can be seen around the field edges. 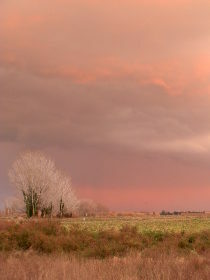 At this time of year (January), the ground is muddy and natural rain water sits in the bottom of the fields. The presence of water and, we suspect, frogs and snails in the water means we can see a heron in just about every field that we pass. On the drive in we were even lucky enough to see a stork. And between the heron fields there are plovers and smaller birds sometimes being monitored by a larger bird of prey. 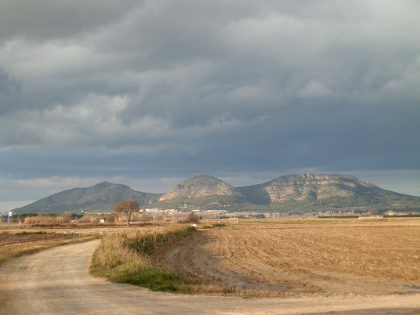 The walk is naturally flat, though being lower than the surrounding countryside we have views up to Pals, standing almost as an island over the fields, and to Quermany and Begur with a sweeping vista towards the hills and then more distant Pyrenees mountains in the background. 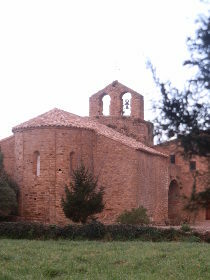 The first place of interest is Can Bach, just across the road that connects to Peratallada. 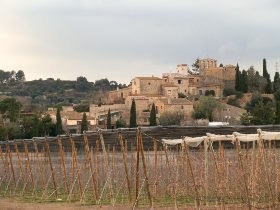 This is an enormous square masia, part of which has been converted into a restaurant. The main part of the building still needs renavation work, but the restaurant is open and busy by the number of cars. One concern that visitors have coming to the Costa Brava out of season, is that places will be closed up. While this is true closer to the coast, inland there is a great vitality all year round with many places open and catering to local and more widespread Catalan visitors. Many of the year round restaurants are therefore off the coast - often in older masia buildings a little way from a village. There a large number in the area of Pals, Palau-sator and Peratallada area with a particular focus on Catalan cooking. From Can Bach we continue towards Pals up to a signpost where we turn left (marked towards Les Basses d'en Coll - a small wetlands area by the beach). To our right we have Pals standing above us like a castle and the villas of Masos de Pals gleaming in the afternoon sun. The path runs just along the main road, and then crosses to get to the Moli d'Arros. The Moli is closed, but is where Arros de Pals is collected and packaged from the rice fields around. 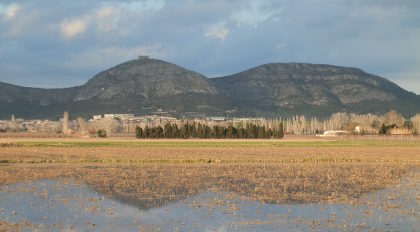 As a rice growing area, Pals is relatively small and select, particularly compared to the Delta d'Ebre, the other source of Catalan rice - but is available in local shops and supermarkets. From the Moli, we continue on the east side of the Torroella road looking out to the small airfield, before crossing the road again and heading towards Fontanilles. Our route back to Fontclara is all road passing next to the espalier orchards that bear the other produce of this area - apples and fruit. The road is relatively newly built and quiet wide, but actually very quite in terms of traffic. As we're walking we can watch a storm crossing over Montgri bringing rain and lightning to L'Estartit in the distance and thunder echoing over the plain. We're still in the last sun of the day which lights the fruit-trees against the dark black of the distant storm.